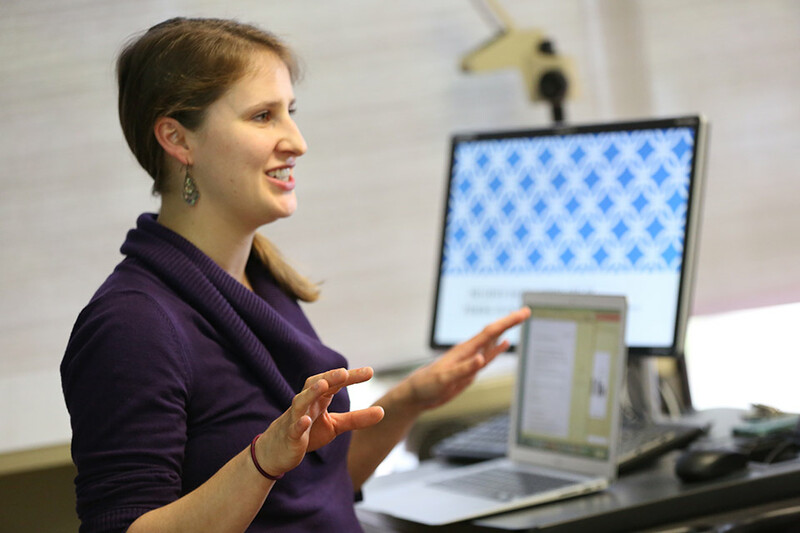 The competitive PhD program at Brandeis aims to educate exceptional psychological scientists, thinkers and teachers who will make important contributions to the field, whether in the academy, industry, or applied settings. Our Brain Body Behavior program provides an overarching, unifying framework that facilitates collaboration and interdisciplinary exchange of ideas. Unlike most PhD programs, we don’t divide students into traditional areas (cognitive, social, developmental etc.). Rather, we aim to foster truly interdisciplinary research and training that helps students develop an area of research specialization while providing opportunities to bring various theoretical and methodological perspectives to work in their chosen area of training. These include not only perspectives from the discipline of psychology, but its intersection with neuroscience, computer science, and biology. We believe that a consideration of body, brain, social and developmental processes is essential to understanding human behavior. This approach is supported through the NIGMS funded Brain, Body and Behavior training grant, which promotes interaction between the psychological and biomedical domains. The PhD program in psychology at Brandeis emphasizes both intense research and breadth and depth of knowledge. You will focus on a particular area of research, while also being part of a community of researchers. Your dissertation adviser will be a leader in his or her field — from cortical-hippocampal interactions in learning to lifespan development, from taste perception to cultural neuroscience, to name a few. In both coursework and interactive workshops, we emphasis rigorous and open science practices and advanced methodological training. Our program has a favorable faculty-to-student ratio, enabling you to gain graduate training through an apprenticeship system in which you will work in close collaboration with one or more faculty members. Dissertation supervisors are leaders in the field and pursue research in the areas listed below. They span from human to animal model research, and use a wide variety of methods including EEG/ERPs, neuroimaging, laboratory tasks, electrophysiology, eye tracking/pupillometry, kinematics, systems neuroscience methods, and longitudinal studies. Before applying, please check with the faculty members you are interested in working with to determine if they will be considering prospective students for the upcoming year, as some labs may be currently full and not considering applicants. Lab rotations in the second year further engage students across labs, supporting collaborative project or learning a new technique. Students select a rotation lab in consultation with their advisor that will complement their research in their home lab. Students continue to work on their research in their home lab along with completing their rotation project over the course of a semester. Rotation projects are tailored to the individual training needs and interests of students, and span from full collaborative studies to learning a new technique. The PhD program is intended to be completed in five years. First-year research project: First year students will work on a first-year research project under the supervision of their primary advisor. Second-year lab rotation: Students complete a rotation in another lab to gain breadth and learn new techniques, normally in the fall semester. A report demonstrating achievement of those goals must be submitted for approval to their primary advisor and their rotation advisor. National Research Service Award (NRSA) Proposal: Second-year students will prepare an NRSA proposal that builds on their first-year research project and their second-year lab rotation to develop a proposed program of research and training. The proposal must be submitted for approval to their primary advisor and their lab rotation advisor. Students formally propose their dissertations in the third year. Students subsequently complete a statistics defense, followed by a dissertation defense by the end of the fifth year. In addition, students complete six elective graduate level seminars during their first three years, including at least one additional advanced statistics or methods class. Students have opportunities to learn advanced statistical methods including SEM and HLM, using platforms including R and Matlab. Students attend the weekly Psychology Research Seminar to learn about other research in the department and from invited speakers who are leaders in the field. Students may take advantage of the Boston Area Graduate Consortium and enroll in graduate courses at Boston College, Boston University or Tufts University. Students have opportunities to participate in journal clubs, workshops, and social activities both within the department and larger university community to further enhance their graduate training and experience. Our program is supported, in part, by a training grant from the National Institute of General Medical Sciences (T32-GM084907-09). Students who apply successfully for an appointment to the BBB training grant must follow the curriculum as described below, but all students are welcome to follow it. Complete two classes that satisfy a biomedical breadth requirement which they can choose from an annually updated list of approved courses as well as biomedical seminars, colloquia, and journal clubs. Within these constraints, students are free to decide with their adviser the precise curriculum that best suits their needs. Visit our research page to learn more about the research areas represented in the department. As a doctoral candidate, you will also learn to teach by serving as a teaching fellow for a variety of courses. We believe that exposure to different professors’ styles in a variety of classroom settings with engaged and motivated undergraduates will provide invaluable preparation for future academic positions or other settings involving teaching or training. Teaching others can also play an important role in consolidating one’s own learning and becoming an expert scholar. The University Prize Instructorships (UPI), sponsored by the Graduate School of Arts & Sciences, offer the opportunity for advanced graduate students to design and teach an undergraduate course in their field of research. In order to compete for the prize, applicants must submit a written statement that explains the relationship between their course and their dissertation research as well as their proposed course’s detailed syllabus and evaluations as teaching fellows. Instructorships are awarded to exceptional doctoral candidates who have made substantial progress toward their degree. Our PhD program prepares you for careers in academic or non-academic research and teaching. You will also be highly qualified for work in policy, healthcare, or other applied fields. Please note that Brandeis does not offer graduate training in clinical psychology or counseling. Funding includes a competitive fellowship, a full-tuition scholarship, and health insurance benefits. The Graduate School of Arts and Sciences supports all doctoral students who maintain satisfactory academic progress with research and teaching assistantships for five years. Students serve as teaching fellows (10 hours/week) for six semesters and are funded for conducting research in their labs the remaining semesters. Students who are interested in gaining additional teaching experience or supplementing their stipends have opportunities to take on additional course assistantships in consultation with their advisor. The Department of Psychology requires all application materials to be submitted by December 1 including letters of recommendation, test scores, and transcripts in order for your application to be given consideration. Contact Professor Angela Gutchess for more information about the doctoral program. Refer to our News and Events section for graduate student achievements, including publications, conference presentations and awards.